The last time I visited my parents, my mother made peanut butter cookies. They were delicious, but we both agreed, a bit too crumbly. 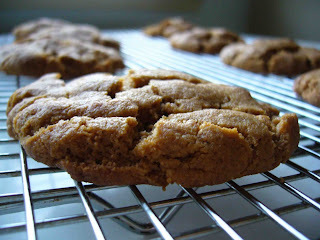 Ever since, I've been on the hunt for a good peanut butter cookie and I think I may have found them. These are flourless and nice and rich, just like a cookie should be. The recipe called for chocolate chips, but I left them out. Add in one cup of chocolate chips if you want to use them. Mix ingredients together and form dough into 2 T balls and place on a cookie sheet. Bake for 12 minutes and cool on rack before enjoying. I love your food photos - they always look amazing. I'm still figuring out how to make my cheap camera take nice pic's of my food! Gorgeous photo and looks delicious! How many calories? LOL! Where does one purchase vanilla bean paiste? These seem as though they would be a good lower carb choice. Hi l Johnson! I get Vanilla Bean Paste at a local gourmet food shop. I did a search on google and found it here http://www.thespicehouse.com/spices/pure-vanilla-bean-paste-madagascar-bourbon-island I'll let you know if I track it down at any major retailers. Thanks!